Work done by the University of Arkansas System Division of Agriculture has found that every dicamba formulation its researchers tested demonstrated volatility, and they also found that some formulations could continue to volatilize at least 36 hours after application and move from the target site in spite of the most label-compliant application efforts. It’s the volatilization and subsequent travel of the chemical that’s at the heart of the hundreds of complaints alleging dicamba misuse. As of August 10, the Arkansas State Plant Board had received 876 complaints. And it’s not just in Arkansas. More than a dozen states have logged dicamba-related complaints. The complaints make note of damage to fruit crops, home gardens, specialty crops and peanuts. However, the highest profile damage is to soybeans that don’t have the tolerance trait. In Arkansas, it’s estimated that about 35% of the state’s 3.5 million soybean acres and about 300,000 of the 400,000 acres of cotton were planted with varieties bred to tolerate dicamba. On August 8, three Division of Agriculture weed scientists – Jason Norsworthy, Tom Barber and Bob Scott – presented their findings during the Northeast Research and Extension Center field day. Graduate student Chris Meyer shared his research on dicamba-impregnated dust. In an interview following the field day presentations, Barber said lab testing found Engenia, XtendiMax and FeXapan to be less volatile than some of the older formulations such as Banvel and Clarity. “However, when you look at the new formulations in a field setting where volatility measurements are based on soybean injury, differences in volatility between older dicamba products such as Clarity and newer ones including Engenia and XtendiMax are not as evident,” Barber said. Some additives made volatility worse. Not only did glufosinate increase volatility, but also the use of ammonium sulfate – which is not a labeled additive for XtendiMax, Engenia or FeXapan. “When you put AMS or any ammonium-based products in the tank with those dicamba formulations, they can cause the parent acid to disassociate from the salt, which greatly increases the amount of volatility,” Barber said. Norsworthy’s research on primary and secondary movement of dicamba found that the herbicide’s volatility is long lived, which means longer exposure for non-tolerant plants and an increase in the chances for movement. The number of acres damaged by dicamba is directly related to the amount applied in an area, he said. One of Norsworthy’s studies involved bringing soybean plants into a field 30 minutes after application and also 24 and 36 hours after spraying. “Those plants were introduced from the greenhouse. They were never exposed to the herbicide, yet, those plants exhibited a tremendous amount of foliar damage or symptomology from dicamba. So that is, when you have a gaseous material that’s in the air, it is able to cause symptomology,” Norsworthy said. Similar results were found with plants covered with buckets during the initial application. Once uncovered, they suffered symptoms that indicated “the herbicide was volatilizing from off the soil 30 minutes after application and causing damage,” he said. Damage occurred to the edge of the field — 220 feet away from the application site, which is twice the buffer distance on the Environmental Protection Agency labels for dicamba products. Barber and Norsworthy were asked about yield loss. Norsworthy said yield loss will depend on a number of factors: how many times the plant was exposed to dicamba, the rate of exposure, at what stage or stages the plants were exposed and whether environmental conditions would enable to the plants to metabolize the herbicide and possibly recover. Volatilization and wind weren’t the only means of movement for dicamba herbicides. Meyer found that dicamba can move on dust particles on roads running through treated fields. These particles can move from the roads and field edges and into the crops, causing injury. Barber’s in-field presentation focused on drift and volatility, and his research on application methods emphasized the importance of boom height and nozzle type. The number of nozzles labeled for use with these dicamba-tolerant crops is limited, he said. “What the data shows is that it’s very important to have the right or the correct nozzle in the sprayer, because it will greatly limit the amount of physical movement through wind and during the application,” Barber said. In tests using a 48-inch boom height with medium, coarse and ultra-coarse droplets, XtendiMax was able to kill soybeans further away than those sprayed a boom height of 24 inches above the canopy. For example, using medium droplets, spray from the 48-inch height killed soybeans more than seven meters away from the boom, versus just over four meters for the 24-inch boom height. When the correct nozzle, such as a TTI producing ultra-coarse droplets is paired with the 24-inch boom height, distance of dead plants was reduced to two meters. Barber said growers sometimes struggle with boom height, fearing that unevenness in the field might result in damage to the boom while deployed. However, “Keeping that boom at 24 inches above the canopy can greatly reduce physical drift from dicamba application,” he said. In talking about volatility, Barber noted that dicamba has been used for decades in the Mid-South on grass and forage crops during the cooler months and as a burndown herbicide before planting begins. 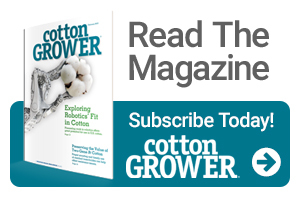 With the advent of dicamba-tolerant soybean and cotton crops, “it’s being applied in-season when temperatures are a lot warmer than they are at the beginning of the year, in spring time. 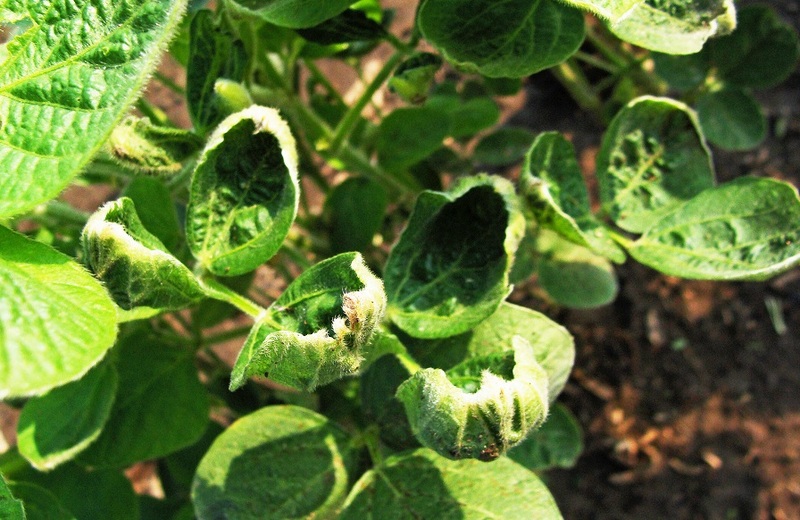 Once daily high temperatures are above 80 degrees during late May or early June, the potential for these dicamba formulations to volatilize becomes a concern,” he said. Scott talked about the HT3 soybean from Monsanto, a “triple stack” soybean that will tolerate three herbicide chemistries: glyphosate, glufosinate and dicamba. 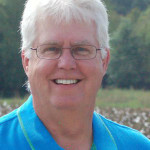 Scott said these beans may be available as early as 2019, but likely in limited amounts. Syngenta and Bayer are working on HPPD-tolerant soybeans “which are further down the line.” The timeline for availability may be 2020 to 2023, Scott said, and the beans are likely to be stacked with other traits.